Fatigue of materials is very important in designing mechanical structures and components. Recently, fatigue databases, databanks and some computer software have been developed for fatigue analysis or fatigue life predictions, and some of them have been commercially available. Those fatigue databases and fatigue analysis software tools are clearly very helpful for the design and analysis engineers to select materials, analyze fatigue performance or estimate fatigue life of structures and components. In order to utilize those databases and software tools successfully in practice, engineers as users are implicitly required to have, more or less, wide and deep, and sometimes even advanced knowledge of fatigue; in other words, this book conveys considerable expertise in fatigue. However, most of the design and analysis engineers do not always have sufficient knowledge in fatigue and therefore, it is not yet easy for them to conduct fatigue design and analysis successfully, although there are many databases and software tools available. An expert system is a very useful, convenient and powerful tool for ordinary engineers to treat complicated engineering problems such as fatigue design and analysis, which require considerable expertise. Although the importance of fatigue expert systems has long been recognized, there is hardly any practically available fatigue expert system to date. Over many years, the authors have been developing some expert systems for fatigue assessment, particularly for the estimation of fatigue properties and for fatigue crack initiation life prediction under variable loading. Recently, in response to a scientific research result, the authors have developed a practically applicable version. They think that the expert system developed is probably the first and only fatigue expert system in the world. This book introduces in detail the expert systems developed and provides the expert system software, most probably in CD. Although it is not developed for commercial purposes, the system software is very easy to use. Park, J. H., and Song, J. H. 1995. “Detailed Evaluation of Methods for Estimation of Fatigue Properties.” International Journal of Fatigue 17:365-73. Lee, K. S., and Song, J. H. 2006. “Estimation Methods for Strain-Life Fatigue Properties from Hardness.” International Journal of Fatigue 28:386-400. Lee, K. S., and Song, J. H. 2009. “An Expert System for Estimation of Fatigue Properties from Simple Tensile Data or Hardness.” Journal of ASTM International 6(no.1):1-15. Neuber, N. 1961. “Theory of Stress Concentration for Shear-Strained Prismatical Bodies with Arbitrary Nonlinear Stress-Strain Law.” Journal of Applied Mechanics, Transactions of ASME(E) 28:544-550. Annual Book of ASTM Standards 2016. “ASTM E1049-85: Standard Practices for Cycle Counting in Fatigue Analysis.” In Section 3 Metals Test Methods and Analytical Procedures, Vol.03.01. Miner, M. A. 1945. “Cumulative Damage in Fatigue,” Journal of Applied Mechanics, Transactions of ASME(E). 12:A159-164. Freudenthal, M., and Heller, R. A. 1958. “On Stress Interaction in Fatigue and a Cumulative Damage Rule: Part I - 2024 Aluminum and SAE 4340 Steel Alloys.” WADCTR, 58-69. Corten, H. T., and Dolan, T. J. 1956. “Cumulative Fatigue Damage.” Proceedings of International Conference on Fatigue for Metals. 235-46. Haibach, E. 1970. “Modified Linear Damage Accumulation Hypothesis Accounting for Decreasing Fatigue Strength during Increasing Fatigue Damage.” Report TM Nr. 50, Darmstadt: Laboratorium fur Betriebsfestigkeit, LBF (In German). Kikukawa, M., Jono, M., and Song, J. H. 1972. “The Cyclic Plastic Strain and Cumulative Fatigue Damage (Fatigue Damage Caused by the Stresses below the Fatigue Limit).” Journal of Society of Materials Science 21:753-58 (In Japanese). Kikukawa, M., Jono, M., Kamamoto, T., Song, J. H., and Himuro, H. 1977. “Low Cycle Fatigue under Varying Strain Conditions (Effects of the Mean Plastic Strain and Stress Factors).” Bulletin of the JSME 20:145-52. Kim, Y. H., Song, J. H., and Park, J. H. 2009. 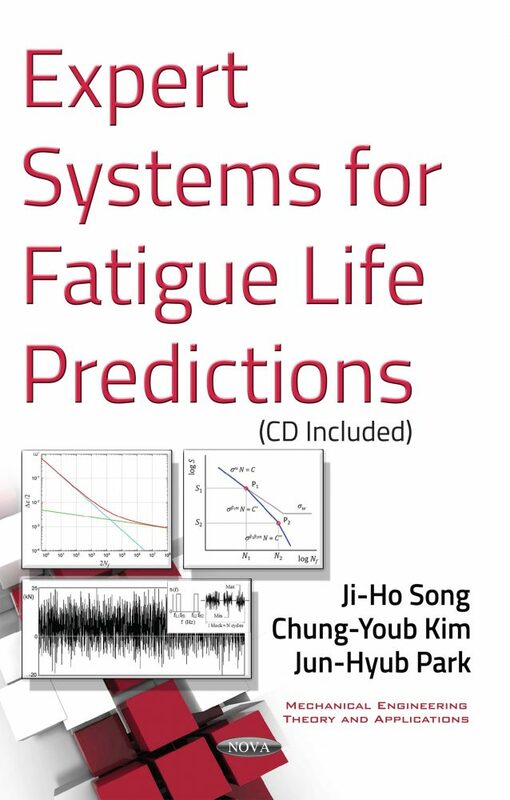 “An Expert System for Fatigue Life Prediction under Variable Loading.” Expert Systems with Applications 36:4996-5008. JSMS, 1998. Data Book on Fatigue Strength of Metallic Materials, Vol.1, Section 2.3. The Society of Materials Science, Japan. Annual Book of ASTM Standards 2009. “ASTM Designation E140-07: Standard Hardness Conversion Tables for Metals, Relationship Among Brinell Hardness, Vickers Hardness, Rockwell Hardness, Superficial Hardness, Knoop Hardness, and Scleroscope Hardness.” In Section 3 Metals Test Methods and Analytical Procedures, Vol.03.01. Hardness Conversion Table. Titanium Technical Manual, Titanium Industries Inc. (www.titanium.com), New Jersey, USA. Manson, S. S. 1965. “Fatigue: A Complex Subject-Some Simple Approximation.” Experimental Mechanics 5:193-226. Mitchell, M. R. 1979. Fundamentals of Modern Fatigue Analysis for Design: Fatigue and Microstructure, Metals Parks, OH: American Society for Metals. 385-437. Tucker, L., and Bussa, S. 1977. “The SAE Cumulative Fatigue Damage Test Program.” In Fatigue under Complex Loading, edited by Richard M. Wetzel, The Society of Automotive Engineers. 1-53. Warrendale, PA: Society of Automotive Engineers. Dowling, N. E., Brose, W. R., and Wilson, W. K. 1977. “Notched member fatigue life predictions by the local strain approach.” In Fatigue under complex loading, edited by Richard M. Wetzel, The Society of Automotive Engineers. 55-84. Warrendale, PA: Society of Automotive Engineers. Creager, M., and Paris, P. C. 1967. “Elastic Field Equations for Blunt Cracks with Reference to Stress Corrosion Cracking.” International Journal of Fracture Mechanics 3:247- 52. Annual Book of ASTM Standards 2016. “ASTM E-399-12: Standard Test Method for Linear-Elastic Plane-Strain Fracture Toughness KIc of Metallic Materials.” In Section 3 Metals Test Methods and Analytical Procedures, Vol.03.01. Hoshida, M. 1974. Vibration Analysis by Probabilistic Method. Kashima Shuppankai (in Japanese). Kondo, Y. 1980 “Study on the Behavior of Fatigue Crack Growth and Closure under Service Loading.” Ph.D Thesis, Osaka University (in Japanese). Kim, C. Y., and Song, J. H. 1994. “Fatigue Crack Closure and Growth Behavior under Random Loading.” Engineering Fracture Mechanics 49:105-20. Masing, G. 1926. “Eigenspannungen und Verfestigung beim Messing.” Proceedings of the Second International Congress for Applied Mechanics, Zurich, Switzerland, 332–335 (in German). Morrow, J. D. 1965. “Cyclic Plastic Strain Energy and Fatigue of Metals,” In ASTM STP 378, 45-87. Topper, T. H., Wetzel, R. M., and Morrow, J. D. 1969. “Neuber’s Rule Applied to Fatigue of Notched Specimens.” Journal of Materials 4:200-9. Peterson, R. E. 1974. Stress Concentration Factors. Hoboken, NJ: John Wiley and Sons, 11. Socie, D., Reemsnyder, H., Downing, S., Tipton, S., Leis, B., and Nelson, D. 1977. “Chapter 10 Fatigue Life Prediction.” In SAE Fatigue Design Handbook, 3rd Ed., edited by Richard C. Rice. 285-382. Warrendale, PA: Society of Automotive Engineers. Sachs, G., Gerberich, W. W., Weiss, V., and Latorre, J. V. 1961. “Low-Cycle Fatigue of Pressure Vessel Materials.” Proceedings of ASME 60:512-29. Song, J. H. 1973. “The Cyclic Plastic Strain Behavior and Cumulative Fatigue Damage by the Stresses below the Fatigue Limit under Actual Loadings.” Ph.D. thesis, Osaka University (In Japanese). Badiru, A. B. 1992. Expert System Applications in Engineering and Manufacturing. Englewood Cliffs, NJ: Prentice Hall. Jeon, W. S., and Song, J. H. 2002. “An Expert System for Estimation of Fatigue Properties of Metallic Materials.” International Journal of Fatigue 24:685-98. This book and the fatigue expert system software may be useful for nearly all engineers, researchers and technologists from the academic, industrial and government sectors who engage in engineering design and maintenance of structures, and also for advanced undergraduate and beginning graduate-level engineering students in universities, particularly in the department of mechanical engineering, aerospace engineering, civil engineering, and metallurgy.